These cultivation activities play a dominant role among different Dao peope groups and areas. Dao Quan Trang (white trousers Dao people), Dao Ao Dai (long tunic, people)) and Dao Thanh Y (blue clothes people)) specialize in wet-rice cultivation. 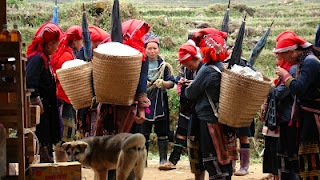 Dao Do (Red Dao ) people mostly cultivate in rocky hollows. Other Dao people groups are nomadic, others are settled agriculturists. Popular crops are rice, corn and vegetables, such as gourds, pumpkins, and sweet potatoes. They raise buffaloes, cows, pigs, chickens, horses, goats in the middle regions of mountains and highland areas. Cotton farming and weaving are popular among the Dao people groups. They prefer garments dyed indigo. Most village wards have forge kilns serving for farming tools repairing. In some places, people make matchlock and flint-lock rifles and cast-iron bullets. The silversmith trade, handed down through generations, mostly produces necklaces, earrings, rings, silvers chains, and betel nut boxes. Dao Do (Red Dao people) and Dao Tien (Coin or Money Dao people)) groups are well-known makers of traditional paper. The paper is used when writing history, story and song books, when making petitions, when sendingmoney for funeral services, and on other occasions. Other Dao people groups are noted for pressing certain fruits to extract oils which they use to illuminate their lamps. Sugarcane is also refined.